Katie Woo Rules the School by Fran Manushkin. A Katie Woo Book. Review: If you're looking for a book that younger kids would enjoy then Katie Woo Rules the School by Fran Manushkin would be the perfect choice. In this book there is a girl named Katie Woo, and she goes through a lot in school. She has a lot of problems but always finds the answer in the end. In Katie Woo Rules the School she is faced with four different challenges. In the first one she loses the class pet. In the second one she gets teased and called names. In the third one she lies to someone about taking his or her toy. And in the last one she wants to get the lead in the school play. Katie Woo Rules the School is good for children ages 5-7. They would like this book because there are not many words per page, so it would be easy for them to read. The character in this book Katie, who is the main character who is in every book in the series. The words are very big on each page and they appropriate for young readers. Plus, the sentences are short and are written with small words like it, she, got, etc. The lesson taught is to never give up on a situation even if you feel like you have to. Most likely a girl would like this book because the main character is a girl and there is only really one main boy character. Because this book is about teaching lessons, little kids would know how to handle challenging situations. So if you need a book to teach lessons about real situations, Katie Woo Rules the School is the perfect book. Review written by Kerstin (6th grade student). We would like to thank Capstone Publishing for providing a copy of Katie Woo Rules the School for this review. 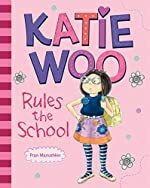 Have you read Katie Woo Rules the School? How would you rate it?